With the title, “Drilling in Extreme Environments” and a Foreword by Harrison “Jack” Schmitt (Apollo 17 Astronaut & geologist), you know that you probably have a good read, but also, a rich resource of very relevant information if your business is the exploration of other worlds. The book is edited by Yoseph Bar-Cohen and Kris Zacny, both giants in their fields, with contributions from over 30 international experts who specialise in both terrestrial and planetary drilling. If you like pictures in a book, you will not be disappointed, this one is loaded with informative tables, photos, CAD models, graphs and diagrams. 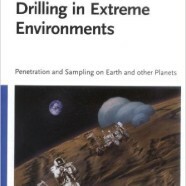 The first half of the book looks at terrestrial drilling, but perhaps of greater interest for the astrobiology community is the second half (p.347 onwards), which focuses on sampling techniques developed for planetary exploration. Having said that, don’t forgo the first few chapters that cover the general topics of practical drilling methods and the penetration of solid objects, in Chapter 1, through to Chapter 2 for an overview of rock physical properties, stresses and energy in drilling and the theories behind the physics of rock breakage. One of the major problems facing remote robotic in situ planetary missions is ambiguity caused by the nature and characteristics of a rock’s measurement surface, which may mask an underlying, more representative mineralogy, petrology or hidden biosignatures (we use the term biosignature broadly here to include isotopic, molecular and morphological indicators). Based on the practice of field geology, it has been firmly established for planetary surface exploration, both manned and remote, that effective sampling of rocks is key to maximising scientific return and the delivery of mission objectives. The first few pages of Chapter 6 sets the context of why sub-surface exploration is needed for the search for evidence of extinct or extant life while setting out the broader scientific rationale for drilling on planets like Mars. What follows is a 196 page discussion of all the major sampling tools and methods developed since Apollo, ranging in technology readiness levels from 4 to 9, why they were used, how they were used, and the effects of the technique on the sample (heating for example);. Importantly, the authors reference each device from the peer reviewed literature, making this book an invaluable and authoritative reference source. The discussion starts with a benchmark tool, the Mars Exploration Rover (MER rover twins) Rock Abrasion Tool, RAT, which flew on both the NASA Spirit and Opportunity Rovers. The RAT was designed to grind a circular patch of approximately 45mm diameter to a depth of 5mm in a dense hard basaltic rock type to remove the weathered surface for subsequent analysis (TRL9). Other instruments and tools discussed include, for example, the Beagle 2 Rock Corer Grinder and PLUTO Mole, the Surveyor Scoop, Viking’s Surface Sampler Acquisition Assembly through to the Phoenix 2007 Scoop. Chapter 6 also looks at a number of techniques currently being developed, including ultrasonic grinders, percussive drills, coring technologies, micro end effectors and instrumented Moles. Acquisition of a sample also demands some discussion of sample handling and processing, which is covered in Chapter 7 with a sub-section on energy requirements for comminution techniques, particle size distribution and sieving. The latter section of Chapter 7 also includes a general overview of manipulators (MER, Phoenix & MSL) and deployment platforms. It is easy to assume that drilling into a rock is relatively straight forward – most of us have at some point drilled into a brick wall when putting up a shelf, so how “hard” can it be? Build a miniature robot to put that shelf up for you, and you have the answer! The book is aimed at anyone with an interest in planetary landers; undergraduate, graduate and specialists will all take something away from either reading or just dipping in to relevant sections of the book. But the real beneficiaries, in my opinion, are astrobiologists who are either developing new instruments (that require a rock sample) or those using data from an instrument where an acquired sample has been used. This is really brought home in Chapter 8 with a discussion of instrument categories, science requirements, geological context, mineralogical identification, sample chemistry and biological analysis; the basic building blocks of instrument selection criteria. And then there is Chapter 9, a subject often ignored, misunderstood or shrouded in “mysticism”; planetary protection and contamination control! The contributing author, Andy Spry (NASA JPL), takes the reader back to basics and brings a wealth of previous experience in robotic planetary missions to bear and elucidates the one area of spacecraft engineering that gives credibility to the science of sampling in extreme environments and hopefully, one day, science that will answer the big question of life outside of the Earth. The internal sampling of rocks on another planet yields some of the highest value science for a given mission, but is difficult at best. “Drilling in Extreme Environments” provides a crucial insight into the field of remote sampling in a hostile environment and really brings home the complex engineering challenges and novel solutions that have met the challenge. This book was published in 2009 and since then we have seen the successful deployment of NASA’s Curiosity rover on Mars in 2012. In 2016 NASA will launch the InSight lander (with a sub-surface Mole deployed instrument package) and in 2018, ESA will launch its ExoMars rover with a 2m sub-surface drill. The Chinese Lunar Exploration Program is planning a 2kg sample return mission in 2017, Mars 2020 is now being designed and private exploration / exploitation of space is widely seen as being commercially viable. I hope the authors are planning a second edition, soon! Reviewed by John Holt, Research Engineer at the University of Leicester.